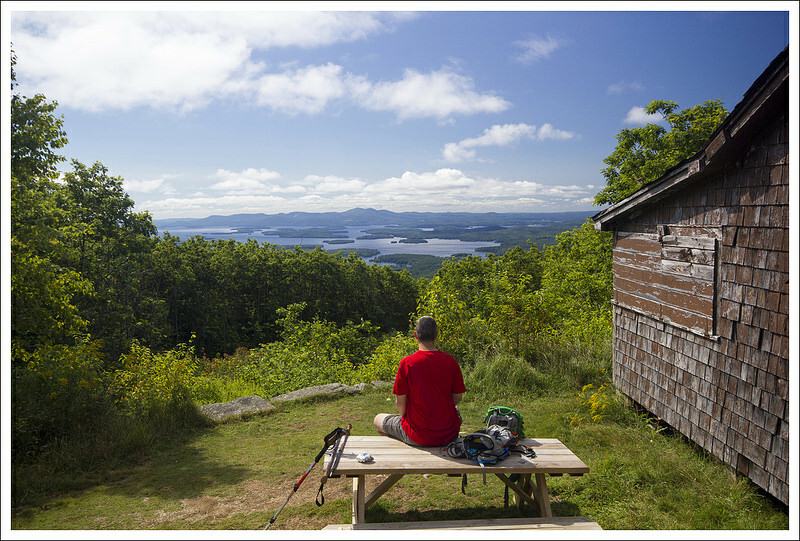 This short, moderately challenging 3.5 mile hike has stunning views of both lakes and mountains from a summit fire tower! Adam Takes in the View from Red Hill. 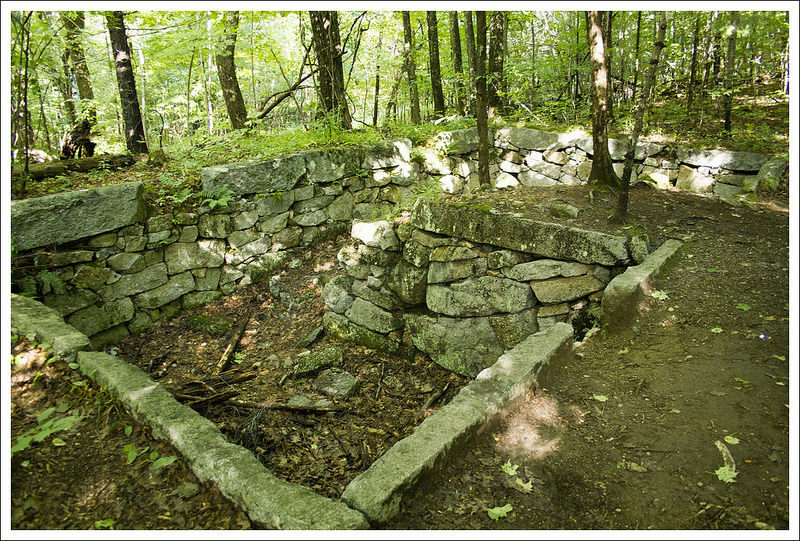 Below: Trail conservancy sign; Adam makes his way up the trail; The foundation of an old farm house along the trail. We considered not hiking at all on our final day in New Hampshire – we needed time to pack and we still wanted to hang out a bit more with my parents. But, it was too gorgeous to stay off the trail – crisp, cool, vivid blue skies punctuated by cottony white clouds. So, for our last hike, we chose something short, relatively easy, and close to my parents’ home in Plymouth. I remembered a conversation we had earlier in the week with a docent from Castle in the Clouds. We had been asking her about the trails on the property. After talking about options on the Lucknow estate, she asked if we’d ever hiked to the top of Red Hill. She told us the hike was very popular with locals and that we should do it if we had time. We looked at maps, and decided Red Hill was the perfect distance and length. When we got to the trailhead, we found the parking area blocked by a construction crew repairing a failed drain pipe under the road. There had been heavy rains the day before, and it looked like the road had buckled and crushed the drain. Luckily, we were able to find a small pullout for parking and walk up to the trailhead. 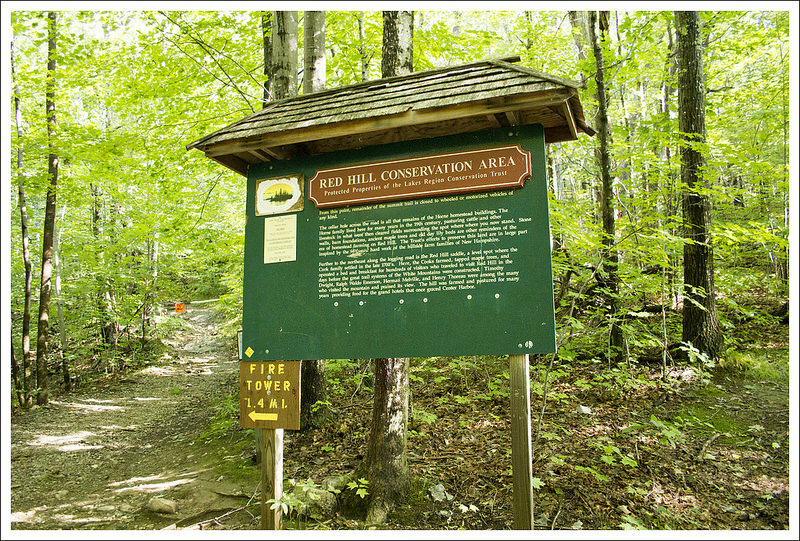 The Red Hill trail is maintained by the Lakes Region Conservation Trust. You’ll see one of their informational panels at the beginning of the trail. Early on, the hiking trail is crossed by snowmobile trails. At about three tenths of a mile in, you’ll find remnants of the old Horne farm and another informational board. Essentially, all that’s left is the foundation, but if you look closely you might see other hints of the farm. Follow signs for the tower, passing a gate indicating an area closed to snowmobiles. From there, the summit is a steady 1.4 mile climb. The trail is not rocky or rooted, and we found it dry and easily passable – even after heavy rain one day before our hike. The summit has a tall firetower and a couple associated buildings. 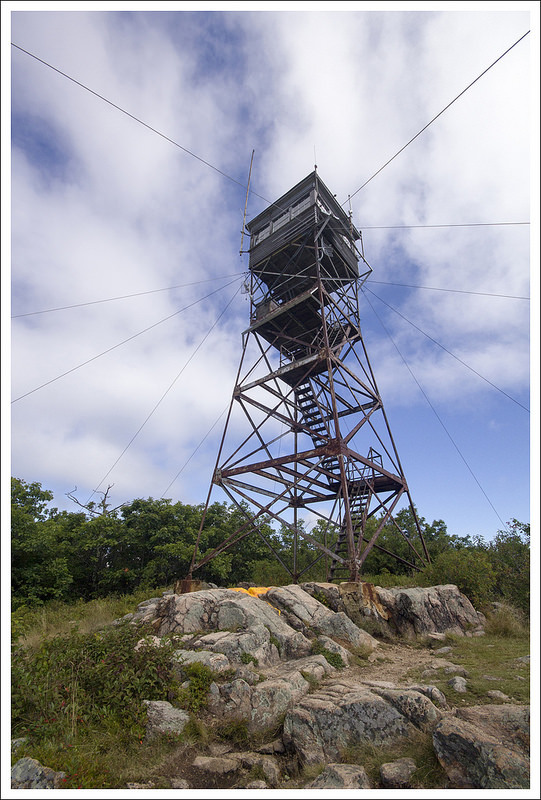 I read online that this is the only firetower in New Hampshire not run by the state. Instead, this one is tended by the Moultonborough Fire Department. 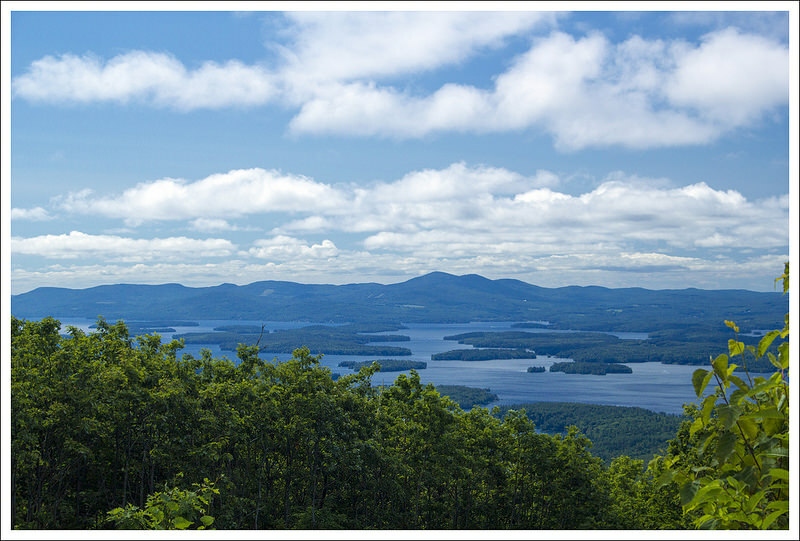 From the summit we enjoyed a superb look at Lake Winnipesaukee from above. 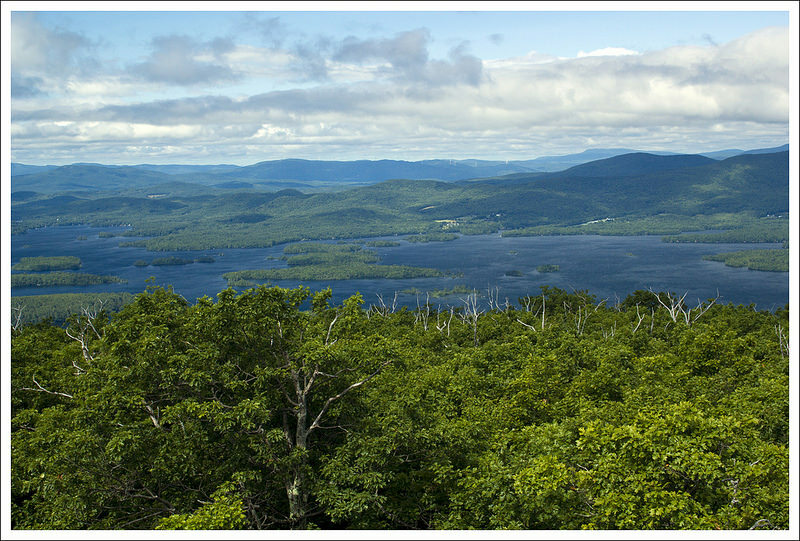 From the tower, we had great views of Squam Lake, the Sandwich Range and the Ossipee Range. It was really windy on the observation platform of the tower, so we didn’t stay on top for long. We shared some snacks and then headed down the way we came. We were lucky to have the summit all to ourselves! On our way down, we passed dozens of people – not surprising! It’s a very nice hike! After getting back to the car, we called my parents and arranged to meet at the Town Docks in Meredith. It was a beautiful day to enjoy one last lakeside lunch! The fire tower atop Red Hill. Below: Buildings at the top of Red Hill; Views in both directions from the fire tower. With our trip to New Hampshire coming to an end, we couldn’t resist hitting the trail one last time. The previous day we had a lot of rain, so we had spent the day shopping around the area to get some souvenirs. There was some flooding from the previous day in some areas. Since we were facing a 12 hour drive the next day back home, we wanted to get a hike that was fairly close and not too long. We remembered our talk with one of the volunteers at Castle in the Clouds and decided to see what this one was like. This hike combines two things I always like to think about when visiting New Hampshire – the many lakes and the mountains. From this viewpoint, you get a picturesque view of both. This definitely is a hike for the locals. We couldn’t find any great information in guide books, but we found a few write-ups online, including a winter trek up from Hike New England. We started on the trail at the kiosk. In .1 mile, the trail splits in half. We opted for the trail to the right, which starts off on a fire road. At .4 miles, the trail comes to the signage for the old farmstead here. The trail takes a sharp left at the sign and continues uphill. The trail was a continuous uphill climb, but the terrain was fairly nice, making for better footing considering the rain from the day before. At 1.5 miles, the trail reaches a junction again with the Red Hill Loop Trail (we did not do the loop option). Continuing to the right for another .2 miles, you’ll reach the summit and fire tower at 1.7 miles. The summit had a nice picnic table at the top near one of the buildings giving you nice views of the lake below. As I’ve mentioned before, I have a bit of a fear over man-made structures, so I felt uneasy about climbing up to the top of the tower. The tower was a little rickety and the wind was blowing strongly, but I felt I couldn’t end the trip without taking in the view. At the top of the tower, you do get some nice views, but we found it was hard to get clear, unobstructed photos due to all the wires and screen around the top. I made my way back to the bottom to get the views that nature had intended from the safer ground. When we arrived at the summit, there was one other person there, who quickly handed over the solitude of the views to us. We stayed for a while to eat a snack and reflect on all of the great hiking we accomplished during this trip. It is always a bitter feeling knowing that you have to return home and back to the doldrums of work and everyday living, but we will have the memories of these mountains, lakes, and beautiful skies to lift our hearts until the next adventure. Difficulty – 2.5. The climbing is moderate, but steady. Trail Conditions – 3.5. This trail is in great shape. The footing is nice and we didn’t have any trouble with mud, even after heavy rains. Views – 4.5. Beautiful – a small markdown because the cables and side panels of the tower block a little bit of the view. You must climb the tower if you want the full view, too. The picnic table at the base has a nice, but not panoramic, view. Ease to Navigate – 3.5 – There are a few crossing snowmobile trails, and there is a trail on the other side of the hill, but generally the route is easy to follow. Solitude – 2. While we enjoyed quite a bit of solitude on our early morning hike, we saw many people hiking up on our hike down. 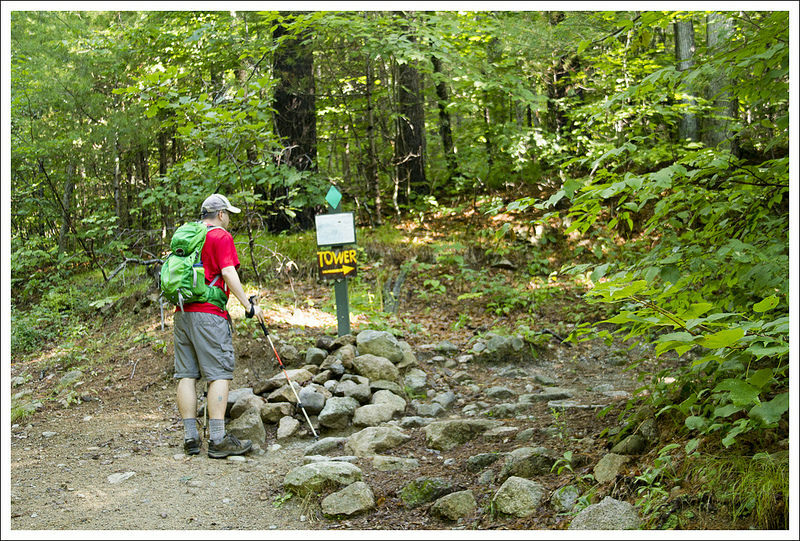 Directions to trailhead: From I-93: Take exit 24 on I-93 for US-3/NH-25 toward Ashland/Holderness. Turn right on US-3 S/NH-25 E and go 9.2 miles. Turn left on NH-25B E and go 2.9 miles. Turn left on Kelsea Avenue and go .2 miles. Turn left onto Bean Rd and go 1.3 miles. Turn right on to Sibley Road and go 1.1 miles. Take a left on to Red Hill Road and go about .2 miles until you reach the parking area to the right. 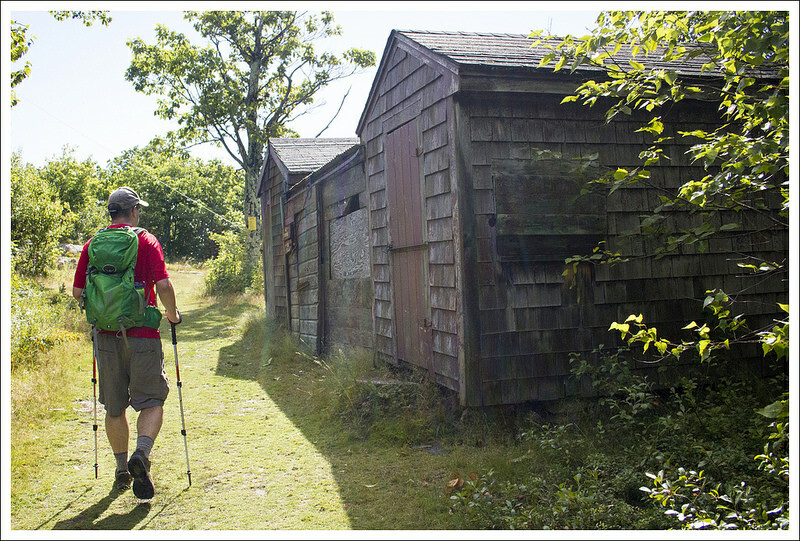 The trail starts off from the kiosk.